Beech Hill was a small community ski area started by the Madbury Recreation Commission in Madbury, CT. It was single rope tow and one slope ski area. The UNH ski team trained here as well for several years. Sadly, high insurance rates and a few bad snow years resulted in the closure of this ski area, sometime in the 1970's. Today, the area has grown in, but remnants of the tow remain, and can be viewed below. I would like to add some more information about the Beech Hill Ski Area in Madbury, NH. The Madbury Recreation Commission was responsible in part for the idea. The land was leased from Jesse Gangwer from Madbury and it was a community project. The rope tow was purchased somewhere in the western part of the state (NH). The brushing out of the slope and the rockpicking was done in part by the New Hampshire Outing Club of UNH. (Beech hill is about 293' high) Bud Booth (a local dairy farmer) pulled by tractor a small warming hut that has been obtained from the University, I think through the work of the commission. 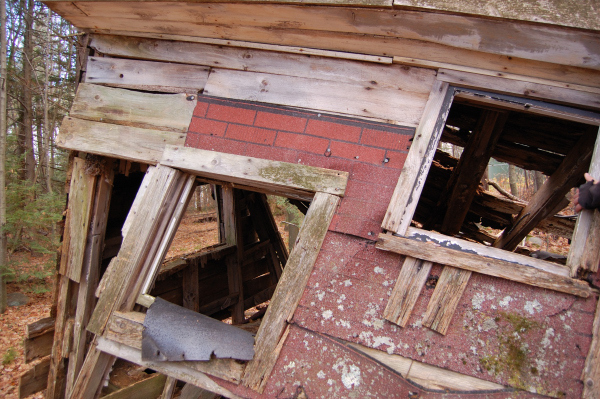 It was fitted with a woodstove after it was pulled in. Lights were rigged from the poles and there was night skiing available. A larger warming hut was donated and erected later. There is at least one woodcut print of the warming hut done by my brother Peter Corrow. Access was by the Demerrit Apartments in Madbury on land also owned by Gangwer. There was only one big trail on the North side of the hill. I worked there as a ski patrol person as a high school student, having just completed a Ambulance Attendant course at UNH. A friend e-mailed me your URL and I was surprised to see a website dedicated to this subject - lost ski areas. Back in the 1960s I was one who worked very hard to organize and clear and get started a small ski slope that could be used for the area residents and particularly the children who would get the most benefit from it. It was one of my bitterest disappointments when it was closed because insurance companies wanted too much money to insure the ski slope and the growing number of "sue crazy" people in society. With all the work and money that was invested in the Cooperative ski area and the usual problems of some snow starved winters; the one problem that we were not able to overcome was that insurance was a must in today's litigious society and before we could open each year the outrageous premium had to be paid . More money than we could hope to make in a good skiing season. Sam Hagner, first told us of this small area that operated on the Durham/Madbury town line. "Beech Hill was located in Durham, though the access may well have been in Madbury. The rope tow was run by locals, often high school students, after the day's classes were finished. It was still open in the early 70's, but just when it closed I cannot say. It was my impression that it, like so many others, simply could not afford the insurance after the famous Stratton Mt. lawsuit changed the scene forever." Tony Federer: The top of the Beech Hill tow was in Durham, and the bottom of this north-facing slope was in Madbury. The hill shows on the USGS map. The mapped power line crosses the ski area halfway down, but wasn't as wide back then. The slope is easy to find now because it is just north of the relatively new water tower on the top of the hill. Access was by a long walk/ski in from Rt 155 in Madbury. 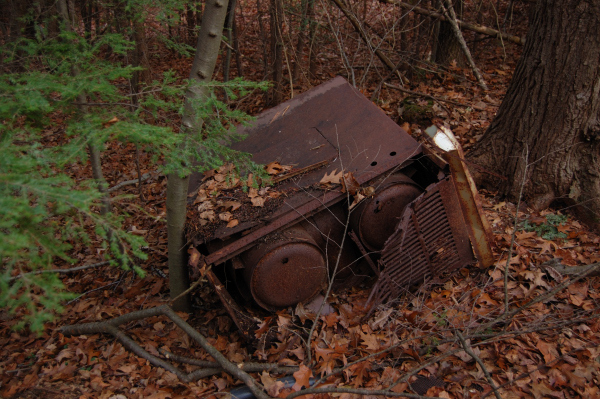 The tow was driven by an old auto engine and chassis that I believe is still there at the top of the regrowing slope. My family skied there a few times but I couldn't say what years. As I remember, the area closed more from a series of several years with insufficient snow than anything else. It was too hard to keep volunteers motivated for maintenance and operation. Mike Dawson: I skied Beech Hill in Madbury as a kid a few times between 1969 and about 1972. At that time you parked just off of Lee Road and walked in along an old farm field about a quarter of a mile to the base of the hill. An old truck with a back tire off served as the motor for a rope tow and there was a little hut that sold tickets and I think food. The hill itself had one slope cleared in the woods and was only about 200 feet long in my memory. No grooming or anything. I remember a surprising number of people for such a small area. Matt Felix: Beech Hill is on the Madbury border 2 miles or so outside of Durham in a very rural spot. The area was run by UNH and not by the town. I once rummaged around in the ruins ski house at the top and found a newspaper from 1950 used as insulation, so that would possibly date the house. It also could be earlier. Hoff Family: The UNH ski team used the area in the early 60's for practices. Fred Meissner and his friends visited this lost area during the fall of 2008 and took some great shots of what is left! 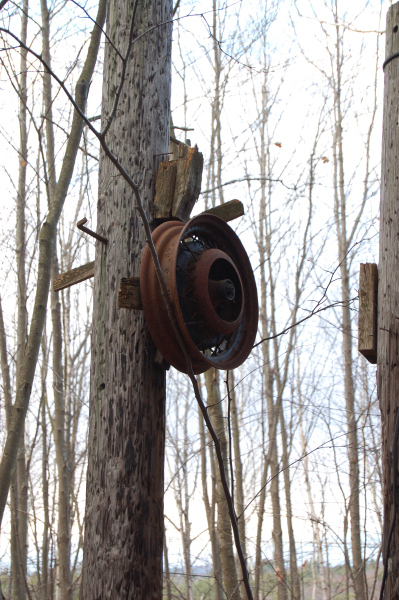 The motor, in the woods near the base. 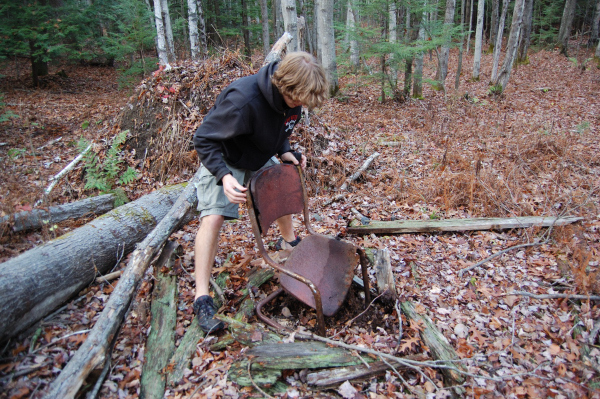 Uncovering a chair in the base area, which has been demolished by a fallen tree. One of the lift towers, one of the few still standing. 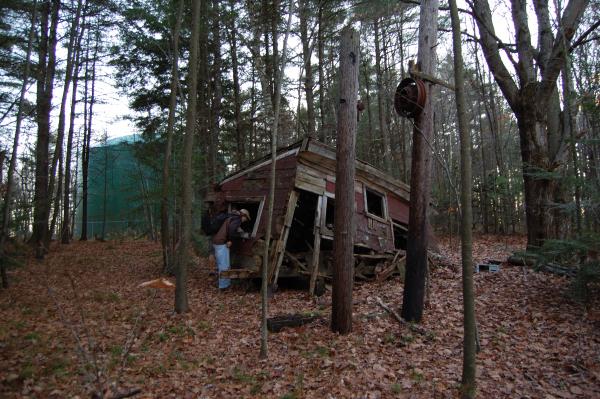 The shack at the summit which probably housed the motor. Another view of the shack at the summit. If you remember this area and have more history or photos, please email us.